Our 12-year old Boxer-Pitbull mix has faced many medical challenges in his life. He recovered from abdominal surgery from eating a piece of blanket, and in later years, had meniscus surgeries on both rear legs. Slim has “hardware” in both rear legs, and last summer, injured his left rear leg while chasing a squirrel (he is young at heart, and old in body!). To compensate, he put too much pressure on his already arthritic elbows, causing them to swell to the point that he was lame. We fearfully took him to our vet, hoping that he would not have to be euthanized. With MAJOR pain medication and MAJOR activity restriction, he gained back some mobility. In order to try and improve his quality of life, I called Dr. Darcy Hoyt to begin weekly acupuncture treatments on 8/30/12. The results were remarkable in both Slim’s mobility and attitude towards life! He is now receiving acupuncture every two weeks. Darcy is so knowledgeable, gentle and kind, that Slim loves having treatment. I have to block our other two dogs from the living room during his treatment because they are so jealous. Slim would be entirely too nervous to benefit from acupuncture at a vet clinic, so Darcy’s home visits make the experience positive and beneficial for Slim. Dr. Hoyt not only prolonged Sis’s life, she gave her the gift of quality of life. At 14, Sis injured her back, resulting in her suffering severe pain and taking away her favorite activity, walking. Due to her age, medications were not an option. Our also wonderful dog walker Robin, suggested acupuncture, which brought us to Dr. Hoyt. Dr. Hoyt is kind, gentle, knowledgeable and skilled. As an added plus, she is mobile. Being a working “puppy parent”, it would have been challenging to get Sis to her treatments. Having Dr. Hoyt come to our home was convenient and gave much calm and comfort to Sis. We lost our beloved Sis last July at the age of 15, due to kidney failure. Dr. Hoyt was of great support and guidance to me during this very difficult and confusing transition. It is always so hard to know when to say good by to the beautiful beings who have been so much a part of our lives. Because of Dr. Hoyt’s treatments, Little Sis was able to spend her last hour doing what gave her the most joy, going on a slow but lovely walk on a beautiful summer day. Dr Hoyt came to our home the first time just as we were moving into it because my elderly dog was highly stressed from all the commotion connected with moving out of and into a house. She also had had severe arthritic pain for several months before this move. in just that first visit, Bella relaxed and even fell asleep! This happened in a corner of a room while movers were all around, including a TV technician making noises directly behind the wall where she reclined. It brought tears to my eyes to see her pain free and at peace. For the next 11 months, Dr Hoyt came to our home every three weeks or so to give Bella acupuncture treatments lasting approximately 45 minutes. She had cautioned us that with dogs Bella’s age (14?) arthritic pain relief would inevitably decline. For several months, Bella was a younger dog again and we all enjoyed walks together a couple times a day. It changed all our lives. Finally, with more muscle and weight loss, Bella found the treatments too invasive. too uncomfortable; so we stopped them. She died less than a month later of euthanasia following a stroke and seizures. We now have Clara, age 9, and when she has arthritic or other symptoms similar to Bella’s, we will call Dr Hoyt again. I had thought about acupuncture for my cat for many years for her arthritis, but four years ago, when she developed kidney failure, I decided to try it. We first went to the acupuncturist who was part of our veterinary practice, but the trips to the clinic were much too stressful for my girl. The veterinary acupuncturist recommended Dr. Darcy Hoyt as someone who does home visits. Dr. Hoyt has been coming to our home, once a month, for four years now. While cats are not always amenable to acupuncture, S did great with it, and I’m sure it was a combination of being treated at home and the kind, compassionate, and skilled approach of Dr. Hoyt. Treatments would focus on a range of issues, whether it was supporting kidney health or appetite stimulation, or general discomfort. She always took her time and provided the best possible care. And also suggested other integrated medicine approaches such as herbs and such. When S was first diagnosed, of course I was devastated, even with assurances from our regular vet that cats can live for a year or two after diagnoses. As I said, we are now going on four years and while she has slowed down, she is still a happy cat who appears to enjoy life. I am convinced that Dr. Hoyt’s ministrations have contributed to her longevity and the quality of her life. Dr Darcy Hoyt has been an amazing veterinarian to my pets for many years. Previously, we saw her at a clinic in SE ptld as our primary vet – I’ve always appreciated her compassion toward both animals and owners, and her knowledge of both conventional and holistic remedies. After being away from Portland for 3 years, I was relieved to find that Darcy was still available for acupuncture house calls for my elderly pet. Acupuncture without a doubt extended the comfort and mobility in my elderly pets lives. Dr Hoyt is easy to contact via email, always has replied promptly, and has been available to answer my questions even when we aren’t scheduling an appointment. Also, she has been on time and always respectful of my home. Her husband is also a vet & is available at Lombard Animal Clinic. Both have amazing compassion & knowledge, big hearts, and have truly gone above and beyond for me & my pets. When my active, hilarious cat was diagnosed with severe degenerative arthritis, I was shocked…and even more shocked that the traditional vet said there was little to be done for her other than a lifetime of harmful painkillers, or extremely expensive orthopedic surgery that probably wouldn’t even work. I refused to accept that answer, and found Darcy Hoyt after doing research about acupuncture and inflammation/pain in animals. The first time Darcy saw her, my cat was unable to walk more than a few steps without holding her leg up in pain. After the first treatment, the cat slept for twelve hours and then got up and walked without limping. After two more treatments, we decided maybe she didn’t need any further acupuncture, since we couldn’t hold her down long enough to administer the treatment. She is running around like a lunatic, apparently in no pain at all. Darcy also prescribed the miraculous neutraceutical Adequan for her, and instructed me in its use. My other cat has a chronic autoimmune skin disorder, for which the traditional vet prescribed steroids that made her continually nauseated and also made her susceptible to severe bladder infections. Again, I’d been told there was no other option for her. I decided to let Darcy take a crack at that. When I canceled the appointment with the dermatology vet and told them I’d decided to try Chinese herbs instead, their response was,”Oh, right. We’ve seen it all. You’ll be back.” Somehow, I don’t think I will be back. After a week of Darcy’s herbs, the cat’s skin condition virtually disappeared. She needs occasional “tune-ups,” but it’s at 1.5 on a scale of 1-10, as opposed to being at 10 when she started the alternative treatment with Darcy. I would recommend Darcy without hesitation to any pet owner. She’s not a vet; she’s a healer. Her breadth of knowledge is amazing, and also, pets just plain like her. She has that “animal whisperer” thing going on. Dr. Darcy Hoyt has been treating my cat, Cardinal, for over a year since he was diagnosed with mega colon and kidney inefficiencies. I have been very impressed with her knowledge, skill, professionalism and friendliness. She is also patient and gentle with my kitty, and is willing to work with me on scheduling. My cat is paranoid about going to the vet, so her house calls are a God-send. I feel fortunate to have her on my team in taking care of my Cardinal. I would not hesitate to recommend her to anyone. I can’t, like some of the other clients, say that Ginger runs up to greet Dr. Hoyt at the door… (more like under the bed or behind the sofa). But she has such a great, soothing way about her that my kittie pretty much settles right in once we have snagged her and stays there for all of her treatment. My cat does not have anything “common” going on with her – two excellent vets and a veterinary neurologist have been stumped by her. She just got up one morning and was extremely wobbly. At this point, almost a year in, the best guess is that she had a stroke with an atypical presentation. This being the case, it has also not been not too easy to establish exactly the effect that acupuncture is having on her. I do believe, though, that it is helping. And I am glad to know that I can do something for her that is not toxic or invasive. I am really happy to have found Dr. Hoyt – she came with excellent recommendations from some of the biggest animal people I know. Worth her weight in gold. 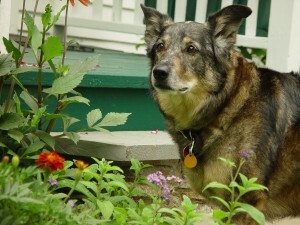 Our Akita mix, Gustine, was a little over 16 when Dr. Hoyt began working with her. Gus was very arthritic and had some spinal involvement as well. When she was no longer able to walk independently, we decided to add acupuncture treatments to the water therapy and medication Gus had been receiving for the last two years. I was reluctant to transport Gus to yet another facility on a regular basis, and unfortunately we discovered Dr. Hoyt’s in-home practice very late in Gus’s treatment. While there were no miracles, I’m convinced that Gus was much more comfortable and relaxed during her last 3 months because of her sessions with Dr. Hoyt. Dr. Hoyt is very professional and knowledgeable, and has had a lot of experience with a variety of animals/ailments. She also knows the veterinary community in the Portland area and was able to provide recommendations/referrals to other animal-related services for another of my pet companions. I highly recommend Dr. Hoyt–I only wish we’d found her sooner. My dog, Sam, was 14 when he met Dr. Hoyt. He had TPLO surgery when he was just 2 years old and developed arthritis in his legs and hips very young. Acupuncture kept Mr. Sam walking and gave him quality of life even in his older years. He always smiled when Dr. Hoyt came to the house to see him and you could see the relief in his face during treatment–it was as though Sam knew he was going to feel amazing, that he was in good hands. Thank you so much for the care and love you provided to Sam! Darcy arrived promptly and did a very thorough examination of my dog. She also explained what could realistically be expected. Then, she went to work. She worked slowly and made sure my dog was comfortable as progressed. I was really impressed. My dog responded well to the treatment. And, I really think it helps to work on the dog in his own home. Dr. Darcy Hoyt is a vet, with specialized training in acupuncture. She makes monthly in-home visits to treat my dog (9 years old) who has problems with stiffness in her back. It’s worth every penny. The dog returns to her younger (more active) self after each appointment. Dr Hoyt has been wonderful in treating my dog Dakota who has degenerative disc disease in his lower back, hip and knee injuries and helped with his anxiety and diet issues! Dakota is healing and able to enjoy returning to being a happy healthy dog ! We count our lucky stars for all Dr Hoyt does for Dakota and I highly recommend her plus she makes house calls and is always helpful in guiding me with Dakota’s health issues and his well being!!! Once again, Dr. Darcy Hoyt helped us to gain time with an elderly dog with her skillful acupuncture. Cody was a 95-pound Belgian shepherd mix that we adopted almost seven years ago from the Oregon Humane Society when he was 7 1/2 years old. Our gentile giant herniated a disc and had to undergo spinal surgery two and a half years ago at age 11! He resumed a nearly normal life for two years, and then developed arthritis in his front legs. Dr. Hoyt made weekly visits. She was able to tell us where Cody’s back muscles were sore and needed massaging, and while he enjoyed a kong with frozen treats, Dr. Hoyt inserted the acupuncture needles. Following his treatments, Cody was so relaxed all evening. We feel that the treatments prolonged Cody’s life, and gave us more quality time with him. Sadly, his back legs weakened to the point that he was unable to stand, and we had him peacefully liberated at home to run beside his buddy, Slim in the Big Sky. Dr. Hoyt’s compassion, knowledge and skills are incredible. I have a 13+ year old lab/shepard/great dane, Lucky who has been suffering from arthritis in his hind area. I had tried laser treatment at the vet, but with his large size (130 pounds) I found it more challenging to get him in and out of the car and to the vet than it seemed to be worth. A friend recommended acupuncture and I was ecstatic to find Dr. Hoyt. It has been great to have her come directly to the house and after only a few treatments we have seen a bit of difference. He seems to get up and down the stairs a little easier and we have been taking short walks as well which he really enjoys. Dr. Hoyt has been wonderful and I would definitely recommend her for anyone wanting the best for their elderly or injured dog. We look forward to more treatments and continual improvements. Dr. Hoyt started seeing my senior labrador Loon in summer 2011. Loon is over 16 now, and has lost a lot of strength in her hind end, making her trip, stoop and not get up and down as easily. Having gone through similar symptoms with another dog that has since passed, I decided to give Loon a different treatment with acupuncture (acupuncture was also recommended by her regular vet). I’ve noticed significant changes with Loon’s activity level and even her general attitude– she seems like a happier dog after treatments. Dr. Hoyt also makes it easier for Loon by coming to my house. As any elderly dog parent knows, sometimes loading your senior pet into the car and taking them to a loud office can be stressful. It’s nice to be able to have Dr. Hoyt come to my home, in an environment that Loon is already comfortable. I’d highly recommend Dr. Hoyt for your elderly pet and their senior care/treatments.